Ovariectomy-induced osteopenia in the rat produces skeletal responses similar to that in a post-menopausal woman. In the ovariectomized (ovx) rat, high bone turnover, and subsequent bone loss, like in the human post-menopausal condition, can be prevented by estrogen replacement. Because of the striking resemblance of skeletal responses in humans and rats in the state of estrogen deficiency, the ovx rat is considered to be a gold standard model for evaluating drugs for prevention and reversal of osteoporosis. This chapter describes the procedure for performing ovariectomy on the rat and the utility of the ovx rat model we have utilized over the last two decades in our laboratory. 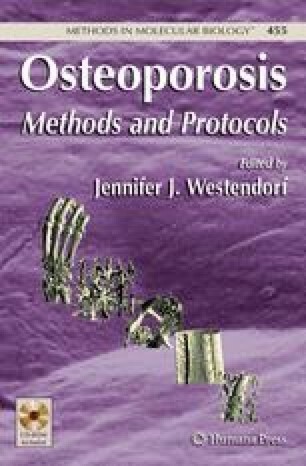 The authors wish to dedicate this article to our late director, Shunichi Harada, who devoted his professional life to osteoporosis research. We also thank Fred Bex and Barry Komm for their guidance, direction, and support of the Wyeth osteoporosis research group. Finally, they are grateful to many talented scientists whose excellent technical support over the last two decades have been instrumental in developing and implementing animal models and analytical methods in their laboratory: special thanks to Joseph Tamasi, James Morzolf, Michelle French, Stephani Smoluk, Andrea Scarcia, Vanessa Dell, Mellisa Wasco, Paula Green, Sally Selim, Colleen Millgan, and Jennifer Pirrello as well as the BioResources staff at Wyeth Research for their valuable assistance.